Tonight, my sister Annie is sharing her delicious recipe for mushroom and leek risotto, which she made for me a few weeks ago. 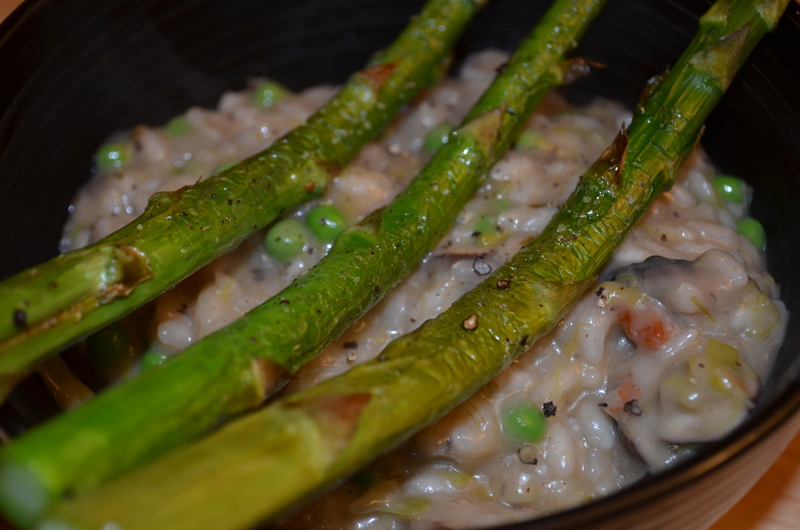 She also roasted asparagus to serve with the risotto. It was to die for. Annie and I both share a love for good food and I am so lucky to have her around my kitchen (as well as in my life!). I am very excited to have her kick off this series. Enjoy her recipe and her wisdom — she knows what she’s talking about. So, you want to know my secrets? Ok. I’ll tell you. 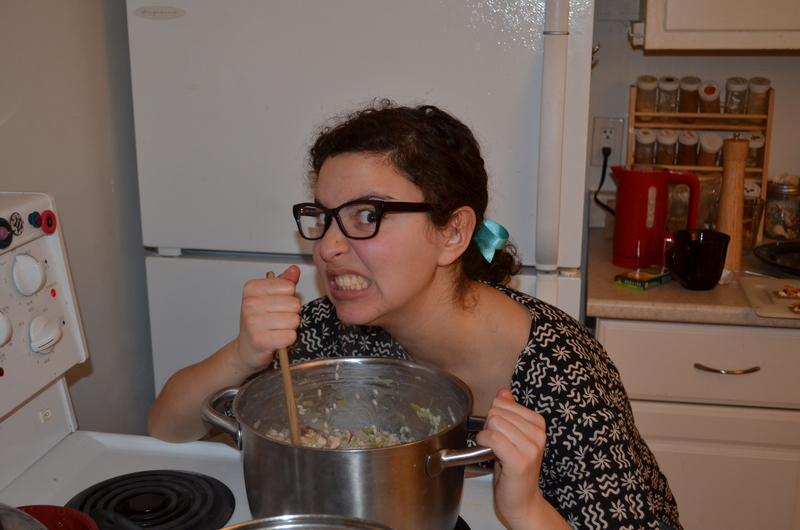 And now, you are ready to take on risotto! And you will CONQUER. Sooooo the fun things about risotto are that it makes you look SUPER fancy and awesome, and that it’s delicious, and that if you have a good basic recipe you can put WHATEVER YOU WANT in it and it will be different and amazing every time! If you use the above ingredients as your base, improvise using your favourite ingredients to make a personalized delicious treat. In this risotto I put mushrooms (Portobello and button), leeks, peas and sundried tomato pesto. We finished it off with oven-roasted asparagus. IT WAS SO DELECTABLY DELICIOUS THAT MY MOUTH ALMOST HURT. OOOOOOOK so now to start. 1. Turn on your theme song and warm up. It’s time to get into the zone. Pour yourself and cooking partners a glass of white wine. 2. Bring the vegetable broth to a boil in a pot and add the wine. Keep over low heat and get your ladle ready. 3. In a big pot, sauté the onions and/or leeks and/or shallots in olive oil over medium heat until translucent. 4. Get your stirring muscles ready! You will be using them from now until the risotto is cooked… in approximately 45 minutes. Annie + elbow grease = magic. 5. Add the rice to the pot and stir for 30 seconds to a minute. Turn the heat down to medium/low and add a ladle of broth. Keep stirring! Always! If you stop, bad things will happen. Stir the rice until the broth has been absorbed, then add another. This is the basic pattern for risotto… keep adding broth and stirring and it will slowly turn into a mouth-watering beauty of a dish. 6. About 25 minutes into this stir-and-add-broth shindig, add the mushrooms in. 7. Keep adding broth and stirring. If you run out of broth and the rice isn’t fully cooked yet, make more broth. And add more wine. 8. When the rice is ALMOST cooked (a little crunchy but almost there), add the peas in. keep doing the taste test (my favourite test!) until the rice is soft and the texture is creamy and everything is awesome. 9. When everything is awesome, add the sundried tomato pesto and parmesan cheese in and make it even MORE awesome! Stir it up until it is beautiful and incredible. Take it off the heat, and NOMZ UNTIL YOU CAN NOMZ NO MORE! So….. yep. I hope you’ve learned a lot about how to be a knockout virtuoso in the kitchen. Flaunt it, baby, flaunt it! 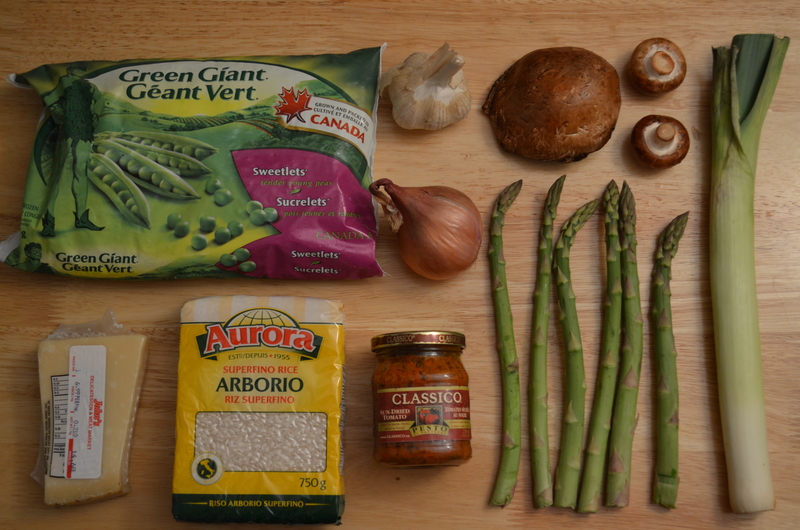 This entry was posted in Entrées, Foodie Friend Friday, Grains, Vegetables, Vegetarian and tagged asparagus, leeks, mushrooms, peas, rice, risotto, vegetables, vegetarian by laratboulos. Bookmark the permalink.